A roof is exposed to severe weather conditions throughout the year. If a roof is not waterproofed properly, it leads to damp patches on the ceiling. In severe cases, water seeps down and results in ceiling damp patches & leakages. 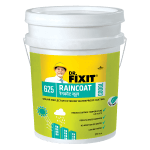 Use Dr. Fixit Roofseal range of solutions for waterproofing of your roof. Your bathroom is exposed to water and moisture every day. This dampness can not only damage the internal walls but also extend to the adjacent external walls. This can result in flaking paint which can spoil the overall aesthetics of your home. Use Dr. Fixit Bathseal range of products for 100% leak free bathroom waterproofing. Use LW+ integral waterproofing solution which enhances and modifies the properties of cement during construction, prevents cracks and dampness, increases the strength of concrete, delays corrosion of steel bars, improves workability of mortar. Use Dr. Fixit LW+ Pidiproof for mild to severe dampness in internal walls. The external walls face the direct brunt of rain and other changes in weather. Therefore, it is not enough to just decorate the building, but also waterproof it. 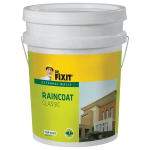 Use Dr. Fixit Raincoat for waterproofing and decorative purposes. Waterproofing water tank is necessary to protect concrete and prevent water leakage. 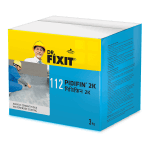 Use Dr. Fixit Pidifin 2K, a two component waterproof coating for overhead water tanks. It is also safe for potable water. My house was facing a terrace seepage situation on the account of water tank overflowing. It was an ongoing issue which was under control for some time but had popped up again. I had heard about waterproofing services by Dr. Fixit being good but wasn’t sure. However, after listening to my contractor, I used the products for my terrace. It’s been over 5 months, and the leakage has stopped, which is a good thing. I hope this issue doesn’t come up again. Great company. All my requirements were taken care off. Give complete solution for the problem. Would definitely recommend all of you for there services. My bedroom walls had a seepage issue since quite some time as it is connected to the bathroom. Even after painting and using various products, the problem occurred frequently and I to spend a lot of money. After consulting my contractor, he suggested the use of Dr. Fixit waterproofing products and waterproofing solutions to prevent this problem. For now, the seepage issue has been suppressed but I hope choosing Dr.Fixit waterproofing products will be a good decision.